The demand for skilled labor in America has never been higher. Employers are struggling to fill a record 6.7 million new job openings. In the construction industry specifically, 78 percent of firms plan to expand their headcount in 2019, although 70 percent admit that they are having trouble finding qualified workers. Trade schools are frequently touted as a solution to the growing labor gap. A trade school is a technical program that teaches skills related to a specific job. With shorter programs, smaller classes, and abundant hands-on training, trade schools often lead to well-paying jobs like electricians, construction workers, and nursing assistants. Despite this, there has been a gradual decline over the past few years in students enrolling in occupational education programs, trade schools, and apprenticeships. IBISWorld predicts a decrease in demand for trade school courses and education. While it seems that young Americans were somewhat aware of the specialized learning opportunities and lower student debt, fewer saw job security and job opportunities as advantages. 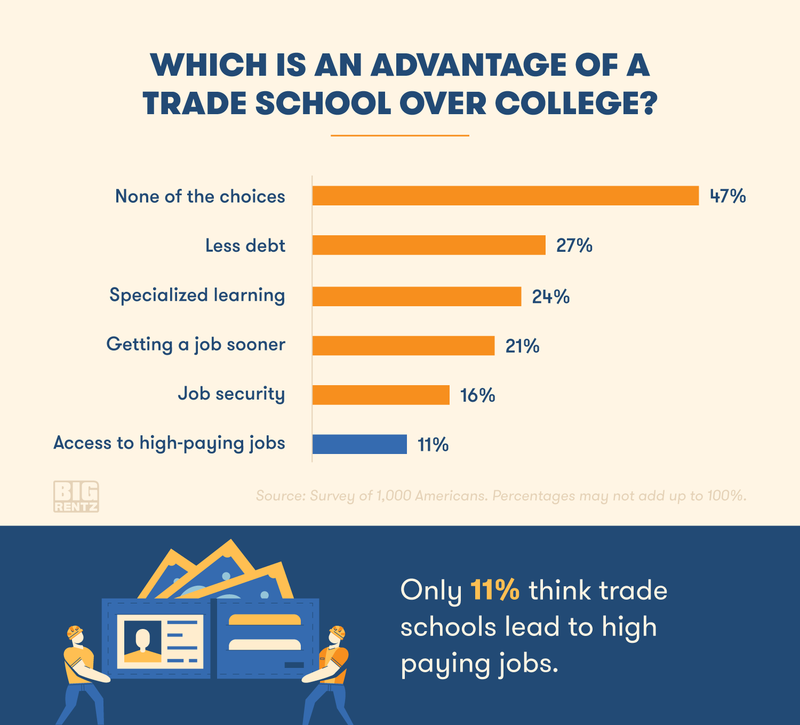 Only 11% thought that trade schools can lead to high-paying jobs. Instead, 43% of Americans selected none of the above as an advantage. While this could mean that young Americans thought of an alternative advantage for trade schools, it could also suggest that they don’t associate crucial factors like job security and well-paid jobs with technical education. 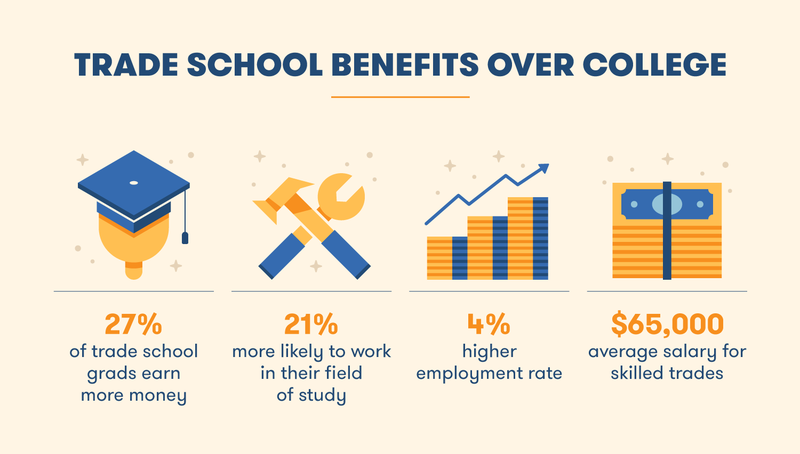 Trade schools offer a number of compelling advantages. Some programs take only six weeks to complete, while longer programs take up to two years. This is significantly shorter than a college program, which often requires four years. The average cost of a trade school education is $33,000 compared to a four-year college’s average $127,000 cost. On top of this, the debt accrued from a four-year college is on average three times the debt from a trade school. Lesser known advantages that we see in our survey are pay potential and job possibilities. Contrary to belief, trade schools provide access to high-paying jobs, such as a landscape designer ($63,000/year) and construction manager ($89,000/year). As opposed to a bachelor’s degree, a trade school certification often guarantees a job in the industry due to the specialized learning, direct skills, and the growing demand for skilled labor. According to the Georgetown Center on Education and the Workforce, about 30 million jobs that pay an average of $55,000 per year do not require a bachelor’s degree. Job security is another advantage, as most jobs obtained through a technical certificate — like carpentry and electrical — are difficult to export to another country. In addition, the aging population of skilled trade workers means more opportunities for young people to enter the field. Our survey also asked respondents aged 18-24 to guess the average entry pay gap between a graduate of trade school and one from a four-year college. A combined 54 percent of young Americans thought workers with a trade school certification made an average of $18,000 less than workers with a bachelor’s degree. 1 in 5 young students alone thought there was a $30,000 gap. The average annual pay difference between trade school entry-level jobs and bachelor’s degree earners is just $12,000. Only 22 percent of Americans got the answer right. While this number does not account for long-term earnings, trade school graduates are able to enter the job field sooner, which means they can earn at least two more years of income. Furthermore, the lower cost of debt offers the possibility of higher net earnings. Would young Americans choose trade school? So why would Americans choose trade school over college? We asked respondents to pick a reason they would opt for technical education. A combined 41% of Americans aged 18-24 years said they would attend a trade school over college for career opportunities and high pay potential. And yet, many have the misconception that trade schools do not pay well. One reason might be lack of knowledge — a survey conducted by Degree Query found that 30 percent of high school students only go to a university because they think it’s the natural path after high school and 23 percent attend college because they feel they are expected to. In summary, our study isn’t to say that a college education offers no advantages, nor should students feel deterred from attending a traditional university. 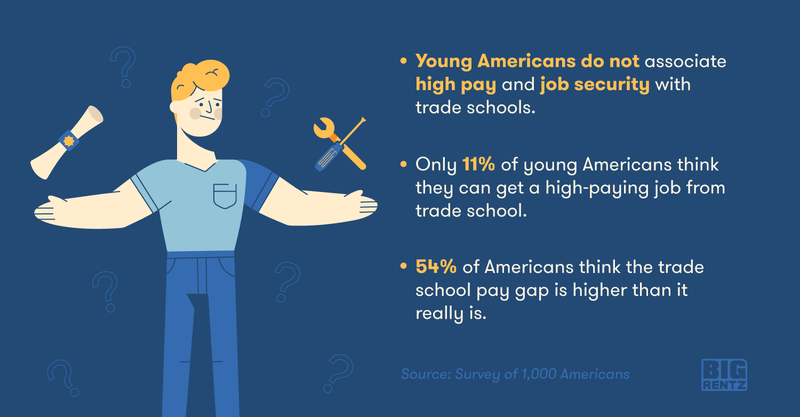 It’s more about how there are so few young Americans who are aware of the possible advantages and opportunities offered by trade schools, despite wanting those benefits. As trade industries continue to expand in 2019 and the skilled labor shortage reaches a critical point, it is important to highlight the value of trade schools and show the skilled trades as an equally viable, well-paying career path. This study was conducted on Google Surveys using three survey questions served to a sample size of at least 1,000 respondents per question. The demographic consisted of people ages 18-24 years old living in the United States. The study was conducted during January 2019.